Another Halloween has come and gone, but in this corner of the internet, Halloween never ends. I was particularly proud of my costume this year, and in thinking about how I’d share it, I realized something: the majority of my Halloween costumes have been quite… monstrous. I take a classic view of Halloween: costumes are meant to be scary. I was never one to dress as a princess or box of crayons, opting even as a child for creatures that walk the night. I distinctly remember my ninth Halloween when I wore a homemade werewolf costume, with fur tearing through my flannel shirt and a wolf mask, to a Halloween party for children at the local community center. None of my friends knew me until I lifted the mask. I was someone else—no, something else, entirely. And I loved it. Recent costumes have taken advantage of face paint rather than masks, but they’re still monstrous: Harley Quinn, a zombie, a sugar skull, and this year, the Babadook. So, you see, my costume choices are not only creepy but also monstrous. There’s a pleasure in subsuming your identity into something foreign, which people like me take advantage of on Halloween. Perhaps this is partially the writer in me; after all, I spend my favorite moments immersed in fictional characters’ lives anyway. So it goes with Halloween: you can become anyone, or anything, and live almost vicariously through this new being. Halloween offers us the chance to melt away our identities into something else, to transform… to become something other, an annual becoming of which the Red Dragon could only dream. I’ve always been fascinated by the monstrous. The term monstrous, you know, actually comes not from horror but from a notion of hybridity: something that is two things at once. Hence the perfect monsters, to us, retain some semblance of the human while also being decidedly inhuman, which is what makes them so horrific. Sure, we all love our Cthulhus and our chupacabras, but the monsters we come back to over and over again are those which retain the human form while being simultaneously, and unnervingly, inhuman (vampires, werewolves, witches, Frankenstein…). That, I realized, is how I’ve been subconsciously choosing my costumes. Harley Quinn is human, sure, but she’s also a clown—something removed from humanity. A zombie was once a human but is no more. A sugar skull? Sure, same thing. The Babadook, being a boogeyman character, looks like a human but surely is something far, far different. What is our fascination with the monstrous? The inhuman masquerading in human form? I think it plays on our deepest fears. Something that does not look human will flag something in our brains right away, but what about something that looks human, that could almost be human… but isn’t? That type of creature tricks you into believing it’s human until it’s too late to realize your mistake. What of the shadow figure in your bedroom watching you sleep, or the grinning man in the top hat whose mouth is just… far… too… large? And what happens when we get to pretend to be something completely other? Something so far removed from ourselves that we can dissolve our own humanity and exist in an implausible realm where anything is possible? 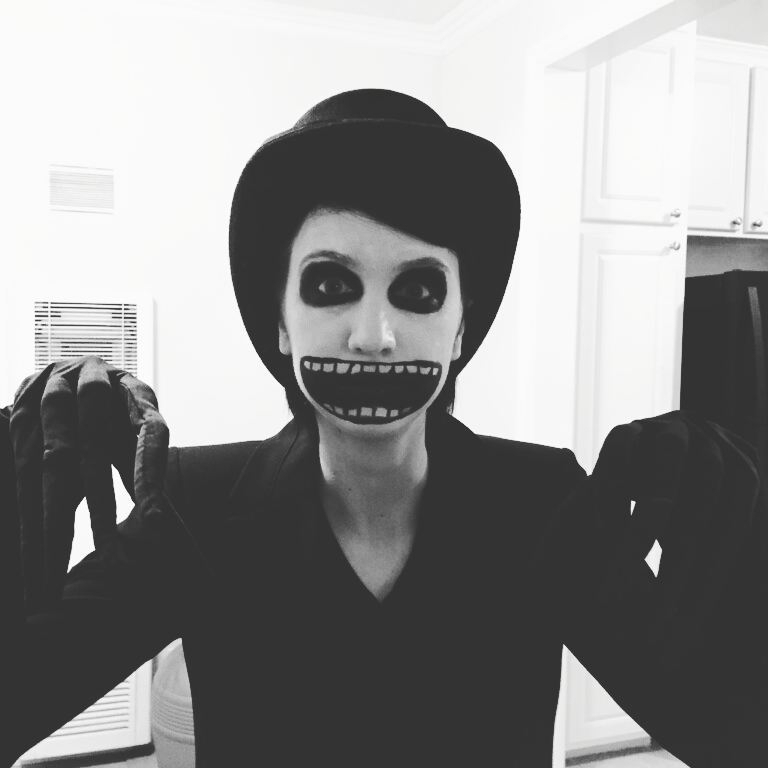 What happens when I can roam the streets of North Hollywood as the Babadook? Some laughs and disturbed looks, apparently, and even the odd photo or two, but that’s not the whole of it. I am me, but I am not me; I am become something entirely other, a being that can exist only on Halloween night. My face is painted and no one sees me; they see only the monster I have become. A monster roams these streets masquerading as Joanna Parypinski, but it is not she. It is a deception. You realize only too late your mistake in assuming that it was, indeed, a mere human. It grins at you, grinning clownishly, with only death in its eyes. And I wish, oh I wish, that Halloween were more than one night a year. I mean, who doesn’t want the chance to wander around looking like this and freaking out everyone they meet? Happy post-Halloween, everyone, and remember: if it’s in a word or it’s in a look, you can’t get rid of the Babadook! Love the costume and the thoughts about the choosing of something scary. Halloween is a perfect time to become someone or something dark and different than yourself. A time to explore your other side.